Present state: The platforms have been demolished and the only evidence of the station are the two railway gate posts on one side of the crossing. Notes: Five Mile House station served the village of Fiskerton on the north bank of the River Witham; it was named after a public house that was used by boatmen with the pub building being used as part of the station. Many passengers using the station had to cross the river using the chain ferry which was operated by railway staff. Due to a lack of traffic, the station was closed on the 1st December 1850, reopening on 1st September 1865 at the request of a local farmer who asked for goods facilities to be provided. Much of the station was destroyed by fire in 1919 probably caused by a spark from a passing locomotive. The stationmaster's house, office, waiting room and signal box were all destroyed. 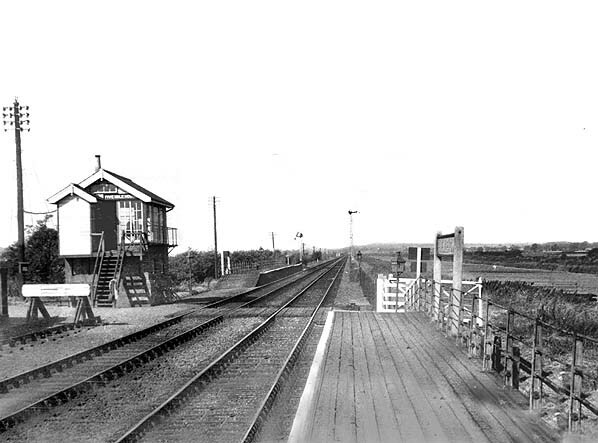 A new signal box was built but the other buildings weren't replaced with two huts being provided, one to act as an office and the other a waiting room with no buildings on the platforms. 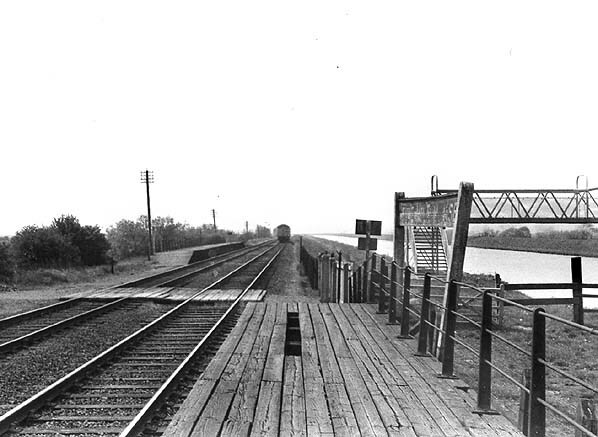 The station had two timber built staggered platforms, one either side of the crossing that led only to the ferry. The signalbox stood on the down side of the line adjacent to the crossing controlling access to the small goods yard which was also on the down side to the east of the crossing. Although remotely sited the station handled a full range of goods traffic including livestock and potatoes, grain and sugar beet. After final closure to both goods and passenger traffic on 15th September 1958, advertised anglers' trains from Rotherham, Sheffield and Wadsley Bridge continued to call at the station on summer weekends until 6th September 1964 when there was just one train in each direction on a Saturday. The ferry closed in 1957 and was replaced by a footbridge. The wooden platforms remained in place at least into the early 1970s; today the Water Rail Way path runs through the site of the station with an interpretation board at the site. The first prospectus of the London and York Railway was issued on 3 May 1844 and plans were deposited in that year's parliamentary session for a main line route running between London and York and a loop line from Peterborough to Bawtry via Boston and Lincoln together with various branches. The line passed its second reading in the commons despite fierce opposition from the London and Birmingham and the newly formed Midland Railway, who at that time had a monopoly of the London to Leeds and York traffic and despite an adverse report from the Board of Trade. The London and York bill finally received Royal assent on 26 June 1846. The bill granted powers to construct the main line and a loop line. Once the bill was passed by parliament, the London & York name was dropped and the title Great Northern Railway (GNR) was adopted. Bawtry to Sheffield had been rejected by parliament, it was thought better for the loop line to rejoin the main line at Rossington instead, so no work was done north of Gainsborough. The GNR suffered a setback in 1848 when this deviation was rejected, but arrangements were soon made to use the MS&LR's authorized line from Sykes Junction (on the loop line north of Lincoln) to Retford and then via their own main line. On 1 March 1848 the East Lincolnshire Railway opened its line between Louth and Grimsby which although nominally independent, was leased to the GNR from the start. This line was extended south to Boston on 1st October 1848. The loop line opened between Werrington Junction and Lincoln via Boston on 17th October 1848, with GNR trains using the Midland line from Werrington Junction into Peterborough. The line between Boston and Lincoln was often referred to locally as the Witham Loop as it followed the course of the River Witham. 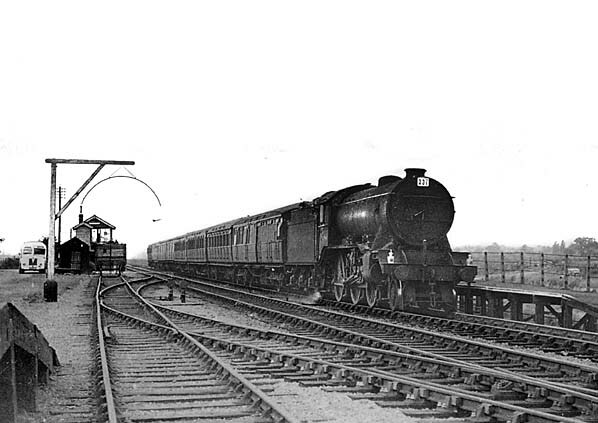 For a brief period this was the main route to the north and Scotland and early traffic exceeded expectations with five daily trains and two on Sundays; but with the opening of the main line from Peterborough to Doncaster via Grantham and Newark in 1850 the loop line settled down to a quieter existence attracting only local traffic. Intermediate stations opened on the same day at Peakirk, Littleworth, Spalding, Algakirk & Sutterton, Langrick, Tattershall, Kirkstead, Bardney & Wragby, Five Mile House & Washingborough. Within two years further stations were added at St. James Deeping, Surfleet, Kirton & Dogdyke. In the early 1850's Horncastle was an important regional centre which serviced a highly productive agricultural area that supplied corn, cattle, wool, and other produce to the heavily populated industrial areas of Lancashire and Yorkshire. The Horncastle Canal ran from the town to the navigable River Witham near Dogdyke station on the Loop Line. In 1851 the GNR built a coal wharf and warehouse on the canal at Horncastle in order to ease the transfer of coal and other heavy goods to the town and surrounding villages. It became clear that the area would be better served by a railway from Horncastle to the Loop Line. Without a railway it was feared the town would decline as competition increased from the fairs and markets of other towns served by a railway. In 1853 the Horncastle Railway Company was formed to build a single line from the Loop Line at Kirkstead to Horncastle. Having received their Act, construction began in March 1855 and the line opened on 11th August 1855. A new line linking Louth with Lincoln was first proposed on 3rd November 1865. The proposed route would leave the ELR at Louth terminating at a junction with the Loop Line east of Five Mile House station. The Louth and Lincoln Railway Company was incorporated on 6th August that year but within a few months it was clear the company would be unable to purchase the land for the proposed junction with the GNR. 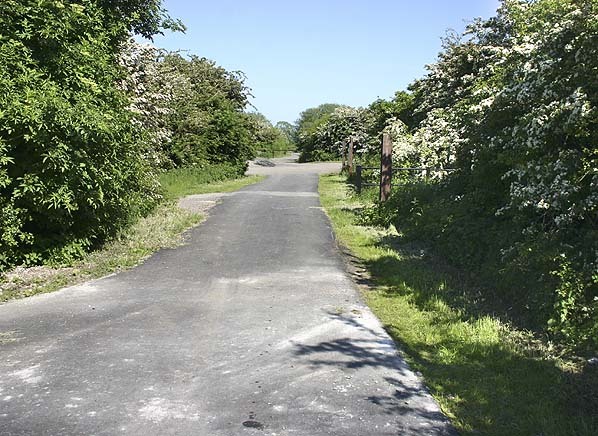 With local funding also proving difficult to raise a shorter revised route was proposed joining the Loop Line at Bardney where all trains would run into a bay platform from the wrong direction, access to the main line requiring the use of cross-overs. The line opened for freight traffic between Bardney and South Willingham on 9th November 1874, this was extended to Donington-on-Bain on 27th September 1875 and finally through to Louth on 26th June 1876. Lords following opposition from the GNR who refused to work the line. On 16th September 1887 the Lincoln, Horncastle, Spilsby & East Coast Railway (HS&ECR) receive authority to build a line from Stixwould on the Loop Line. On this occasion the GNR didn't appose the Bill agreeing to work the line for 60 per cent of the receipts. The company was unable to raise sufficient capital and the GNR declined an offer to take over the powers when the scheme was abandoned in 1891. There were no further proposals for a northern route into Skegness until 1910 when Skegness Town Council approached the GNR asking for better service to the resort from Manchester, Birmingham and Leeds. It suggested a line linking the Spilsby & Horncastle branches stating that if the GNR was not sympathetic they would seek help from the Midland Railway. An alternative scheme was also suggested with a new line being built from Kirkstead on the Loop Line to Little Steeping on the ELR. The GNR Board approved the latter scheme and a light railway order was granted on 18th July 1911. Although the new railway’s official title was ‘The Kirkstead and Little Steeping Railway’ it was universally known as the ‘New Line’. Construction of the 15-mile double track line started at both ends in March 1912. The line left the Loop Line at Coningsby junction 1 1/2 miles south of Kirkstead station, joining the ELR at Beliwater Junction, between Eastville and Little Steeping. The new line opened for goods on 1st June and passengers on 1st July, 1913. In 1922 Kirkstead was renamed Woodhall Junction in an attempt to increase the profile of nearby Woodhall Spa as a holiday destination. Some north Lincolnshire branch lines lost their service before the Beeching Axe fell. The Horncastle line closed to passengers on 13th September 1954 although it remained open for goods traffic until April 1971. The intermediate stations between Peterborough and Spalding and Spalding and Boston closed on 11th September 1961. The section of the Loop Line between Woodhall Junction and Boston was closed to passengers and goods on 17th June 1963 because traffic levels didn't justify the required expenditure on the track and signalling that was required to keep the line in use leaving a service from Lincoln over the loop line to Coningsby Junction and then via the 'New Line' to Firsby. Coningsby became the railhead for the area previously covered by Tattershall & Dogdyke and some trains from Lincoln terminated there. British Railways also suggested the closure of the Lincoln to Skegness line to take effect from 6th June, 1964. This would have seen the closure of the New Line as well as the northern section of the Lincoln to Boston line. With the Grimsby to Boston line also under threat the biggest local enquiry held by the Transport Users’ Consultative Committee took place in Skegness on 15th and 16th September, 1964 to hear objections to the proposals. British Railways board should re-examine its proposals. This it did and in due course once again proposed closure, this time with the exception of the Skegness line. A second TUCC inquiry was held at Skegness in May 1968 and its decisions were again submitted to the Transport Minister who this time supported the Board’s proposals. He felt that costs of retain the existing rail services in Lincolnshire could not be justified because of the low usage and the considerable route mileage involved. On the New Line only Coningsby had regular passengers travelling mainly to Lincoln with very few people using the other intermediate stations. The Minister accepted that passengers travelling on the Coningsby-Lincoln section of the line would suffer inconvenience amounting almost to hardship if this section were closed but he also noted that the numbers concerned were small and he didn't consider that he would be justified in asking the Board to retain this particular service. Closure of the Lincoln - Firsby line was announced for 5th October 1970 with the last train running on Saturday 3rd October 1970. On the same date the service was also withdrawn from the southern end of the loop line between Peterborough and Boston although all the intermediate stations were already closed. Boston and Spalding remained open as they could be reached by other routes. The line between Spalding and Peterborough reopened with a limited (peak hours only) passenger service on 7 June 1971. Freight continued to operate to Horncastle, via Woodhall Junction, until April 5th 1971, when Bardney became the terminus of the line. The line between Lincoln & Bardney remained open for freight traffic serving the sugar beet factory adjacent to Bardney station. This traffic ceased in January 1981 by which date there were very few trains which ran 'as required' on Monday, Wednesday and Friday during the beet season (March - September); The last passenger train, a DMU railtour, ran into Bardney on 21st January 1981. The station site was sold to British Sugar in 1982 and all the track was lifted within a year. Peterborough - Spalding remains open on weekdays but none of the intermediate stations were ever reopened although there is now a campaign to re-open Littleworth. 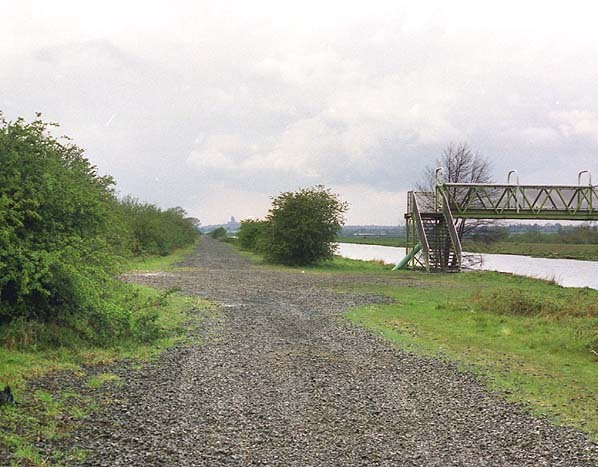 The line between Spalding and Boston was used for a new route for the A16 road in 1994. Much of the Loop Line between Lincoln and Boston has now been restored as a public footpath and cycleway known as the Water Rail Way with interpretation boards at some of the stations. The Water Rail Way consists of 20 miles of off-road path and 13 miles on quiet lanes. The route opened in stages with the final section between Langrick and Boston opening at the end of October 2008. In 2008 the Bardney Heritage Centre was opened in a new building next to the old goods shed. The Heritage Centre is open Thursday - Sunday throughout the year and daily during school summer holidays. The Heritage Centre is housed in a new building which is a replica of the original station building with a section of rebuilt platform. St. James Deeping & Peakirk. A Skegness excursion at Five Mile House station in July 1950. The goods dock is seen on the far left. The down platform is beyond the signalbox. The derelict Five Mile House station looking west in May 1970. Note the signalbox has been demolished and and a footbridge has been built across the River Witham to replace the chain ferry.